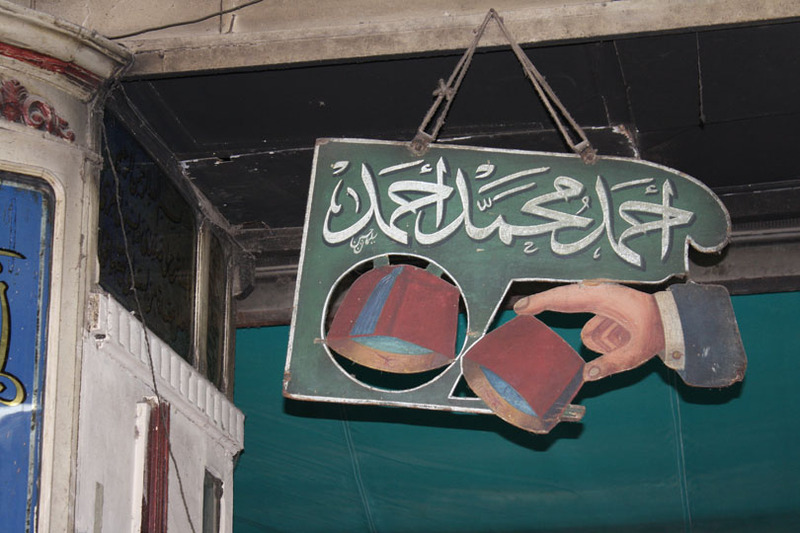 In Cairo, Egypt, a short walk from the historic Bab Zuwayla city gate, is Cairo’s last remaining tarboosh artisan shop. Tarboosh is the word Egyptians use for what people in North America might call a fez. 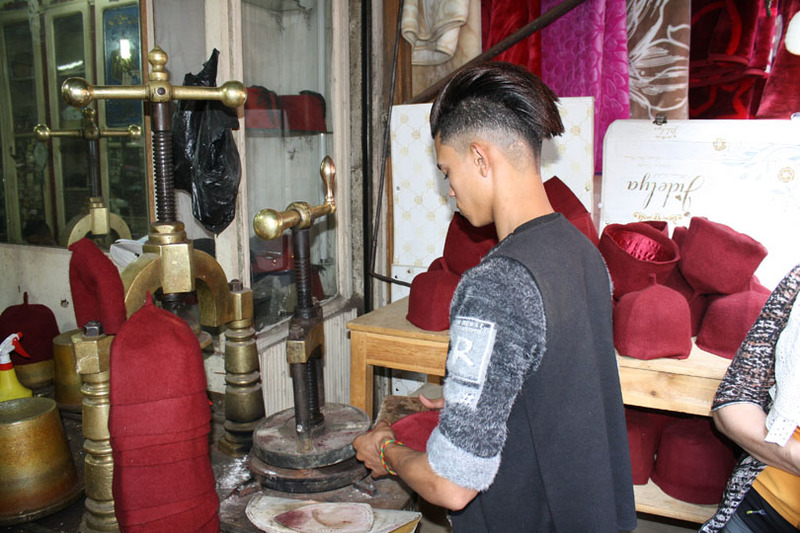 This shop in the Khan al-Khalili market makes high-quality woolen tarbooshes by hand, in the traditional way. I visited it on April 23, 2018. 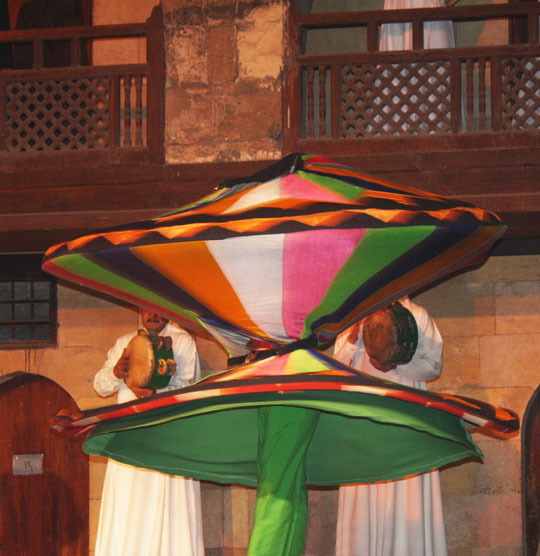 The tarboosh was fashionable among Egyptian men during the era of the Ottoman Empire. Although the Ottoman Empire itself fell in 1920, the Ottoman viceroy in Egypt declared himself king and continued to rule until Egypt’s revolution in 1952. Since 1952, the tarbooshes have declined in popularity, but the shop continues to generate enough business to continue making them. They export them to many other Muslim countries such as Morocco and Tunisia. The hand-operated tools are used to shape the tarbooshes. 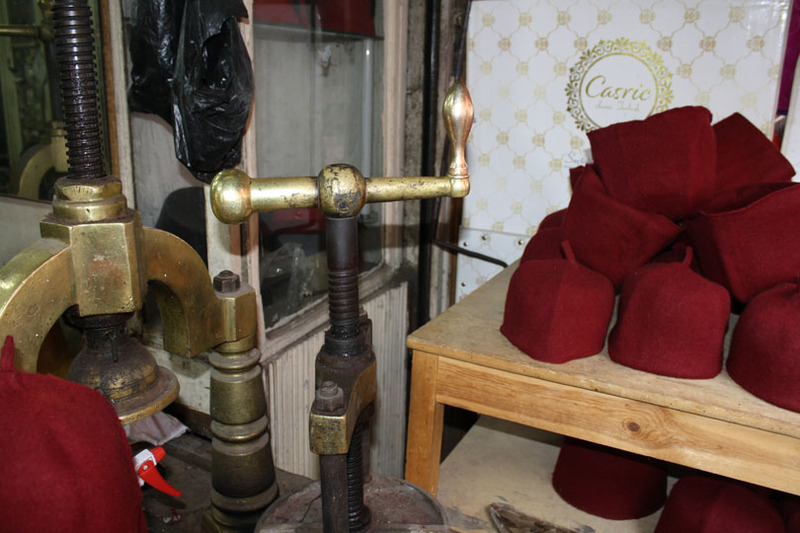 Not only does the shop sell the hats, it also reshapes hats which have been crushed or rumpled through wear. 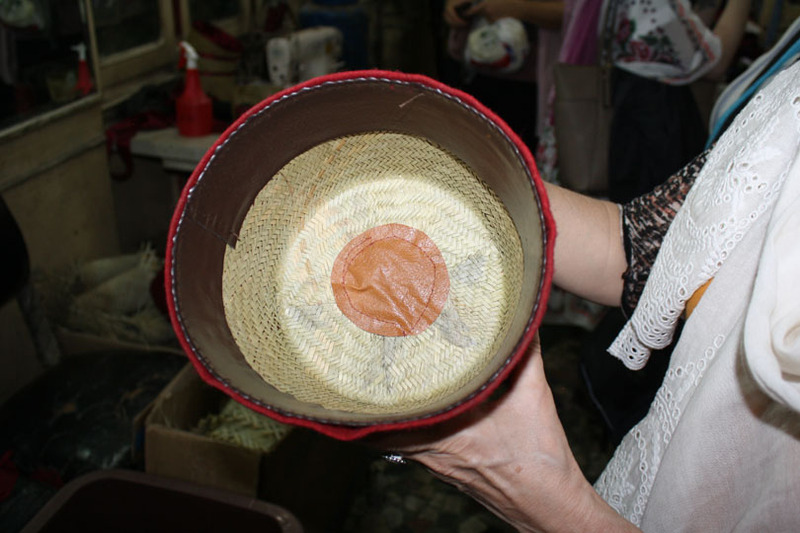 The photo below shows how the hats are shaped. The shop is equipped with several different sizes of brass molds. These molds come in pairs, with one being slightly larger than the other. 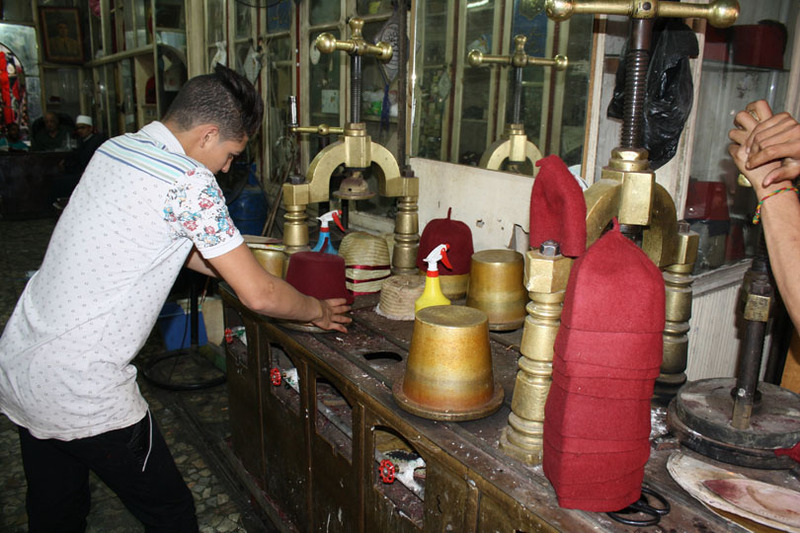 First the artisan stretches a tarboosh over the smaller mold in the pair, as he is doing in the photo below. Then he presses over it the heated larger mold, so that the woolen fabric is held between the two. 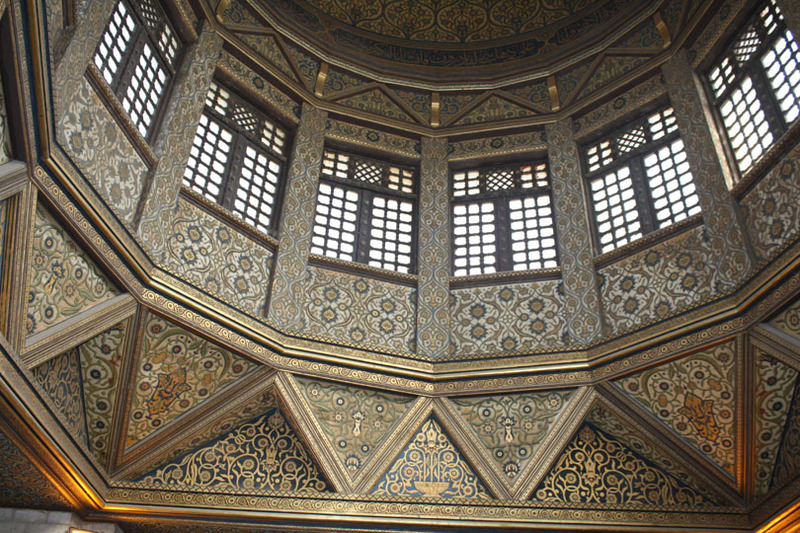 The photo below shows the interior of a tarboosh. The red felt outer layer is made of wool. Inside it, the stiffening layer is made from palm. A lining around the inner edge protects the head from the scratchy texture of the palm. Our guide had grown up as a boy near this shop. He told us that he always liked to run past the shop and use his fist to crush the tarbooshes that were on display. One day, the shop owner caught him, and recognized him, and complained to his father. His father was very angry, and beat him for it. However, the next day the mischievous boy did it again! Today, he laughs as he tells the story. I don’t think he’s sorry at all! For several of my trips to Egypt, I have traveled with Sahra Kent, through her Journey Through Egypt program. The tarboosh shop is one of the places I have discovered through traveling with her. I highly recommend the Journey Through Egypt program to anyone who is interested in a cultural perspective of Egypt. Rain is rare in Egypt, because of its location in the Sahara desert. In my previous visits to Egypt, the “rain” I experienced was similar to what we might call “sprinkling” in my home in the U.S., and it lasted only a short time. 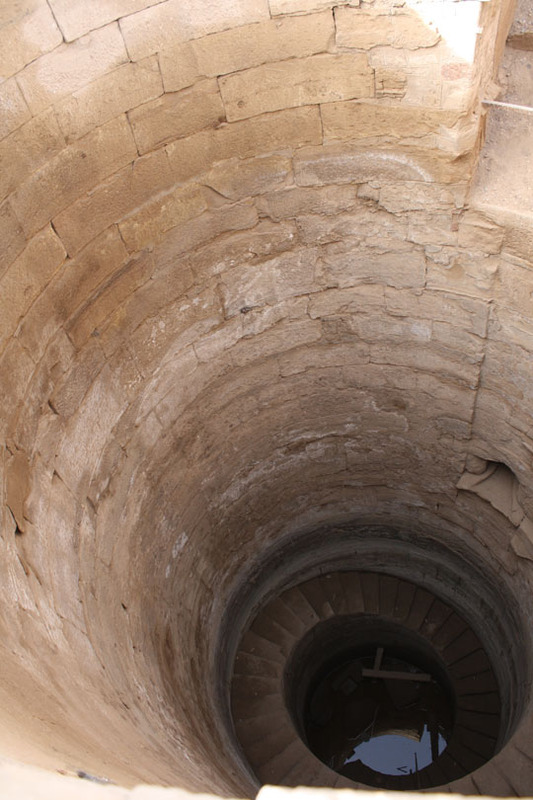 The average rainfall in Cairo for April is 1/4 inch (7 mm) in the entire month. 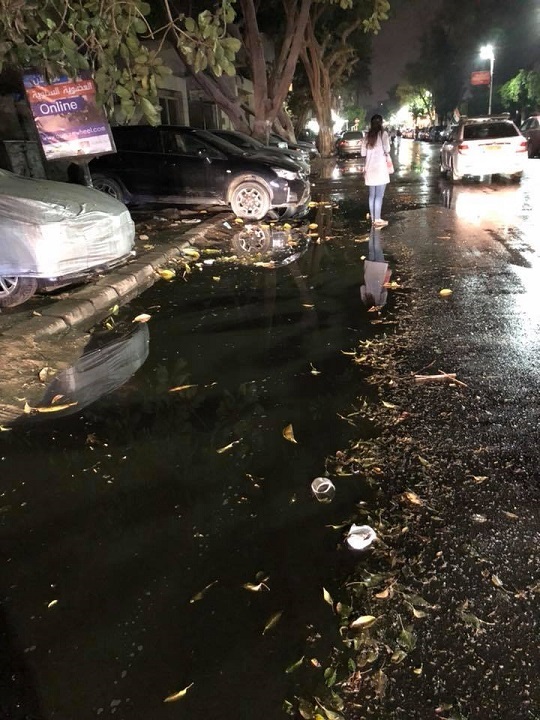 So, imagine my surprise when we experienced two days of genuine thunderstorms with heavy rain on April 24 and 25, 2018 while I was in Cairo! And then, a week later, a miniature thunderstorm came to Luxor on May 1! There are no storm drains, so streets quickly became flooded. Cars stalled when the flood waters overwhelmed them. People didn’t know how to drive on the rain-slick roads. Building roofs leaked, because they normally don’t need to be watertight. I was eating supper at Felfela restaurant with rain dripping on my head! But it was okay, because I was enjoying the sound of the storm. Events were canceled due to rain leaking through roofs. 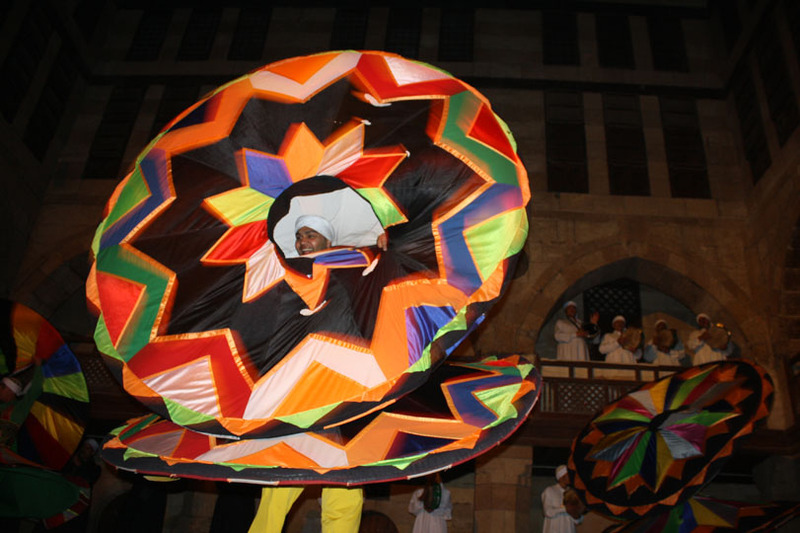 For example, the Balloon Theater canceled a performance by the Kowmiyya dance company one evening due to rain. Parts of Cairo’s Ring Road were shut down for several hours due to flooding. Many people needed to sleep in their cars. The road closure caused traffic snarls throughout Cairo as people tried to find other ways to get home. Some buildings and bridges collapsed. In Luxor, the “thunderstorm” consisted of one flash of lightning and one brief rumble of thunder, followed by some sprinkling. Therefore, we didn’t have the above problems that come from heavy rain. However, the locals were so worried about the storm that they insisted that the members of our group who intended to walk somewhere take a bus instead. I live in a part of the U.S. that experiences frequent thunderstorms, with heavy rains. My dad used to call these storms “toadstranglers”. Therefore, I have always taken storm drains, culverts, and watertight roofs for granted. It never occurred to me that other places would forego such infrastructure. It makes sense, of course. Why would you need to build watertight roofs and storm drains in the Sahara desert? I can understand why it might be viewed as an unnecessary expense in a place that gets thunderstorms so rarely. Author JewelPosted on April 28, 2018 May 4, 2018 Categories Egypt, Nature's BeautyTags Cairo, downpour, Egypt, nature, rain, rainfall, thunderstorm, weatherLeave a comment on Thunderstorms in Egypt! Edfu, Egypt: Dance Like an Egyptian! The stereotype of “Pharaonic dance” with the bent elbow and wrist arm positions is deeply embedded in U.S. culture, and has been since about the 1920’s. Buster Keaton does those arm positions in the 1918 silent movie The Cook which also stars Fatty Arbuckle. 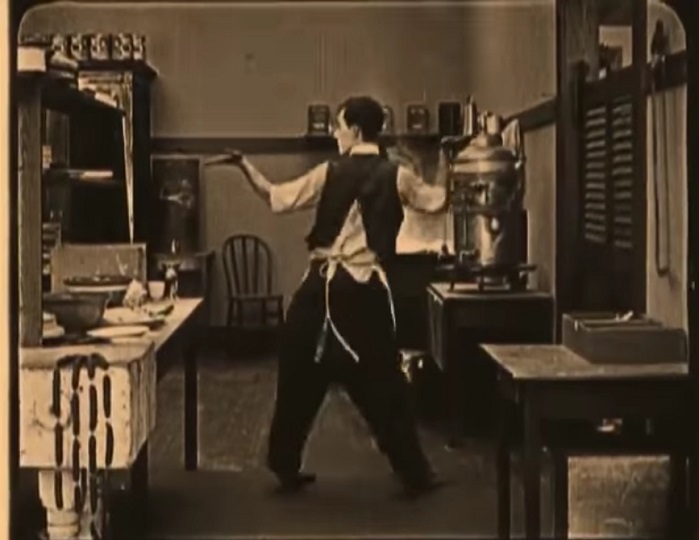 Buster Keaton makes “Egyptian arms” in a dance scene from the 1918 silent movie “The Cook”. These arm positions have also shown up in cartoons, countless “Pharaonic” dance performances, and the music videos such as the Bangles’ “Walk Like an Egyptian”. When Irena Lexova wrote Ancient Egyptian Dances in 1935, her initial objective was to examine whether this stereotype was indeed accurate. Shira shows the stereotype of “Pharaonic” arms. For many years, I’ve been looking for evidence showing that “Pharaonic arms” actually were part of dance in ancient Egypt. On my many trips to Egypt, I have looked for images on temple and tomb walls demonstrating such a pose, without finding any. I have also dug through books and articles about ancient Egypt. I’ve discovered many other dance scenes with other postures, but not the right-angled joints. 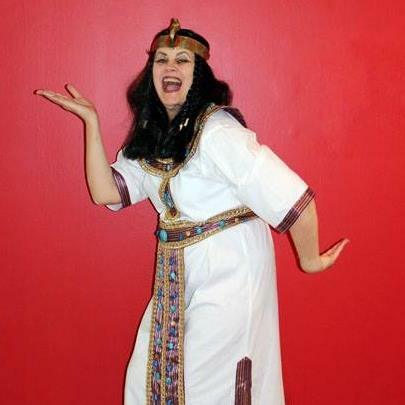 In her book Ancient Egyptian Dances, Irena Lexova stated her conclusion that this pose came from the Etruscan civilization (in what is now modern-day Italy), not Egypt. 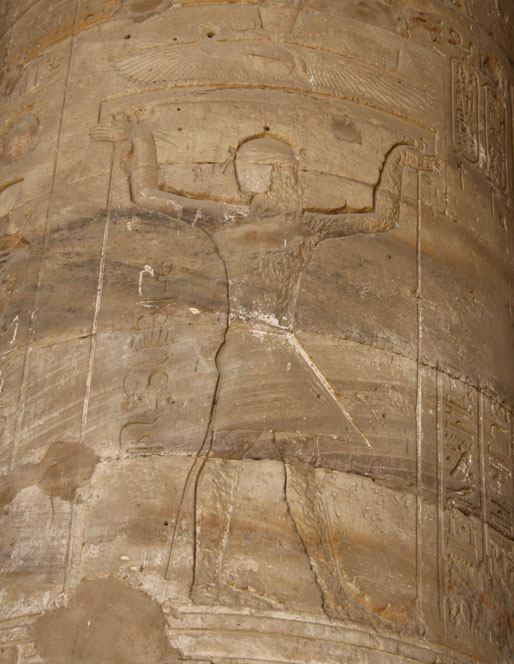 This image at the Temple of Horus in Edfu, Egypt shows the bent wrists and arms that the public thinks of as Pharaonic dance. So imagine my surprise in February 2017, on my 12th trip to Egypt, when I spotted one at the Temple of Horus in Edfu, Egypt! This was my 7th time visiting that temple. Why didn’t I see this on any of my previous 6 visits? I asked the Egyptologist who was acting as our tour guide whether this was a “dance” or some other activity. 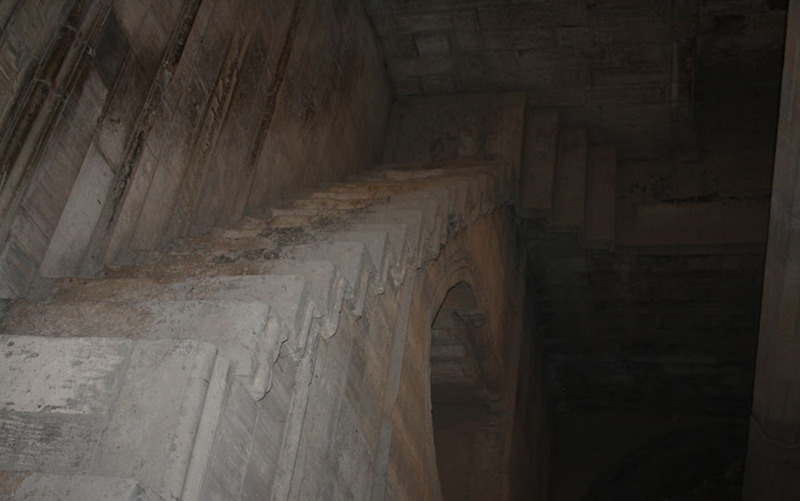 (In Egypt, in order to become a licensed tour guide, an individual must obtain an advanced degree in Egyptology as well as meet some other qualifications.) 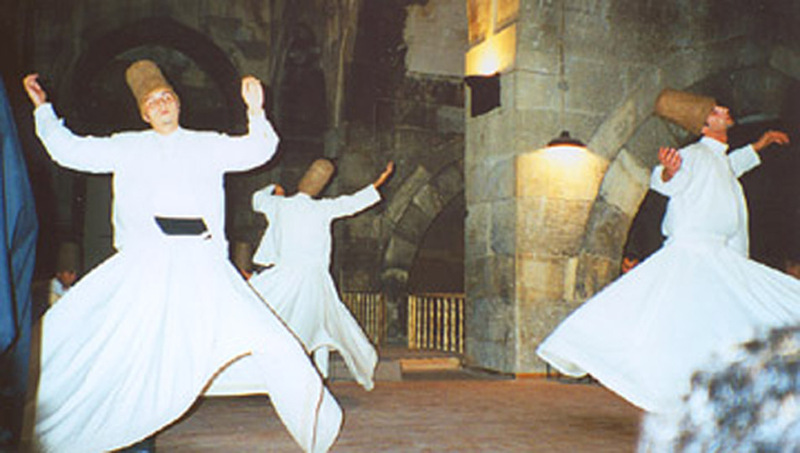 He said yes, it was a liturgical dance being performed by a priest. So, what does this image suggest about the stereotype of the “Pharaonic” wrist and elbow posture? This dance is done by men. I have not yet found images of women doing it. The “Pharaonic” arm position was used for religious ritualistic dance. This dance was known to Egyptians as of 200 BCE, because construction on the temple building that stands at Edfu today was begun in 237 BCE. I haven’t yet found earlier images of it. I still have never seen this type of arm position anywhere in Egypt other than the Edfu Temple. I realize it’s possible that it appears elsewhere, but so far I haven’t found it. I’ll keep looking. I said for many years that I didn’t believe there was ever a bent wrist-and-elbow dance posture in ancient Egyptian dance because all of my prior research seemed to indicate there was not. It seems I was wrong. It’s time to update my thinking! Author JewelPosted on April 22, 2018 October 8, 2018 Categories Egypt, HistoryTags ancient, arms, dance, Edfu, Egypt, elbows, Horus, liturgical, Pharaonic, religious, sacred, temple, wrists2 Comments on Edfu, Egypt: Dance Like an Egyptian! 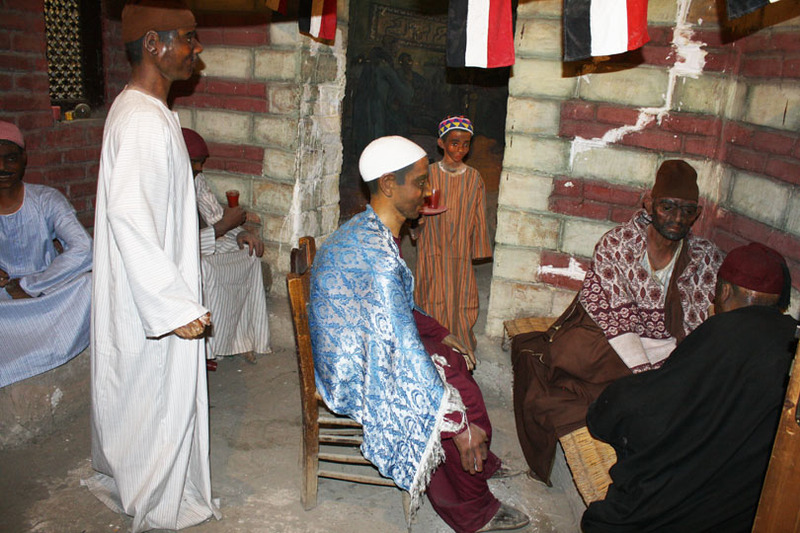 Cairo offers an opportunity for visitors to see Egypt’s remaining vestiges of an East African practice known as a zar ritual. 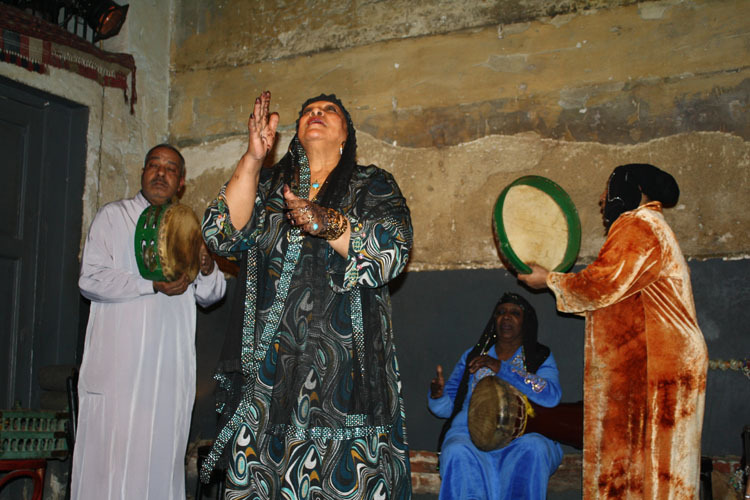 It is no longer legal in Egypt to conduct zar rituals; however, it is still possible to see performances of the music used for them. A zar is a spirit which is believed to inhabit people, especially women. When the woman’s life is in balance, she and the spirit can coexist in peace. However, sometimes the woman begins to suffer stress, become irritable, or fall ill. In those cases, in order for her to recover, it may be necessary to appease the zar spirit. The purpose of a zar ritual is to perform that appeasement. 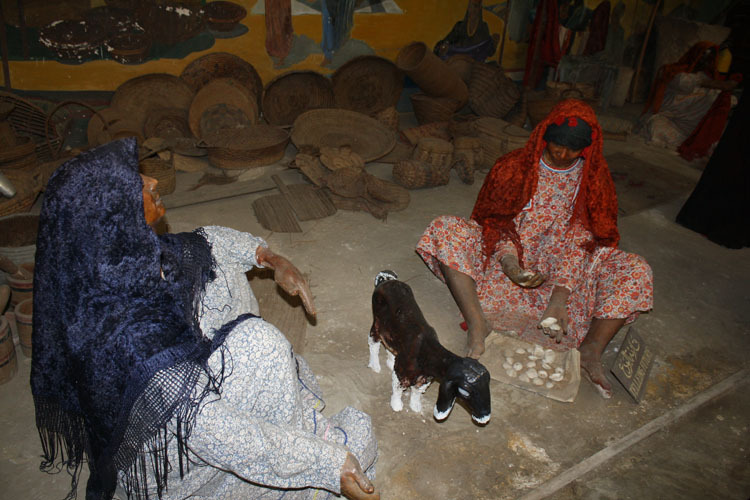 In a traditional zar ritual in Egypt, a woman would surround herself with other women who are a meaningful part of her life: sisters, cousins, friends, etc. They would sacrifice a chicken, and engage a band of musicians capable of performing the specialty music required for the ritual. According to tradition, there are many different zar spirits which can inhabit a person. Each such spirit responds to a different song and rhythm. The musicians would perform several different songs, aiming to find the music required to appease the particular spirit that has inhabited the woman. As the music progresses, the participants are drawn into a state of ecstatic dance. 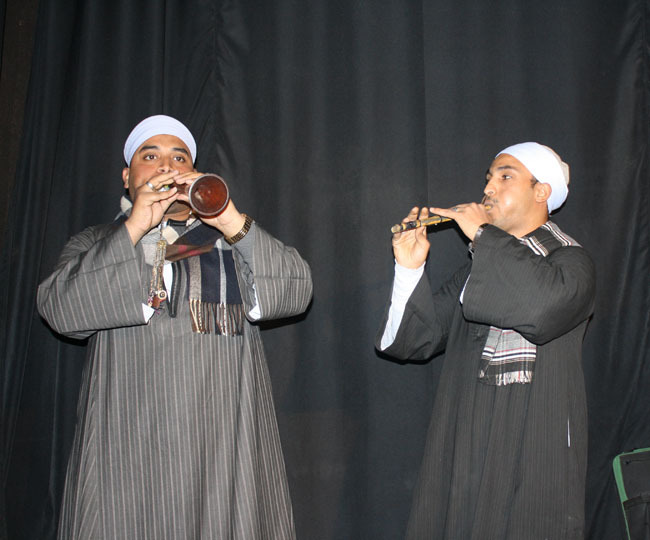 The Mazaher ensemble are among the final zar practitioners in Egypt. Although the law no longer allows them to conduct full zar ceremonies, it is possible to hear them perform concerts of the music that accompanies the ceremonies. I have seen them perform several times at the Makan Theater in Cairo. 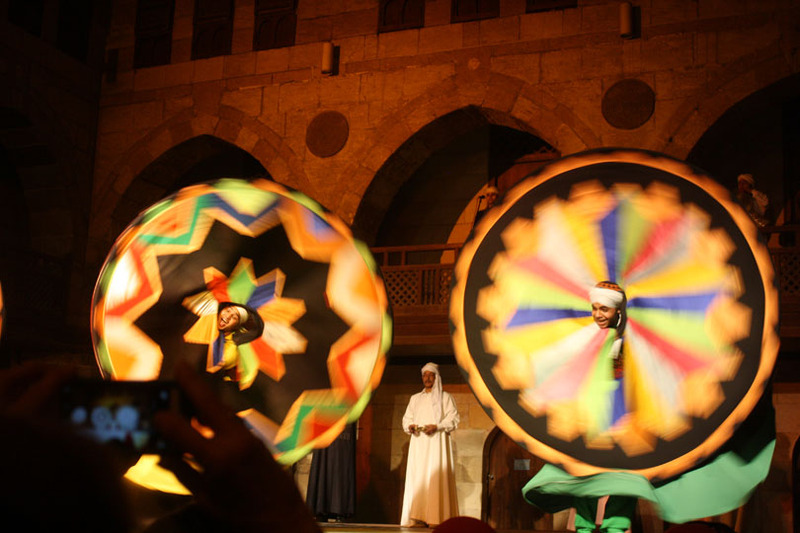 It is a captivating show, and I always enjoy seeing it again whenever I return to Egypt. 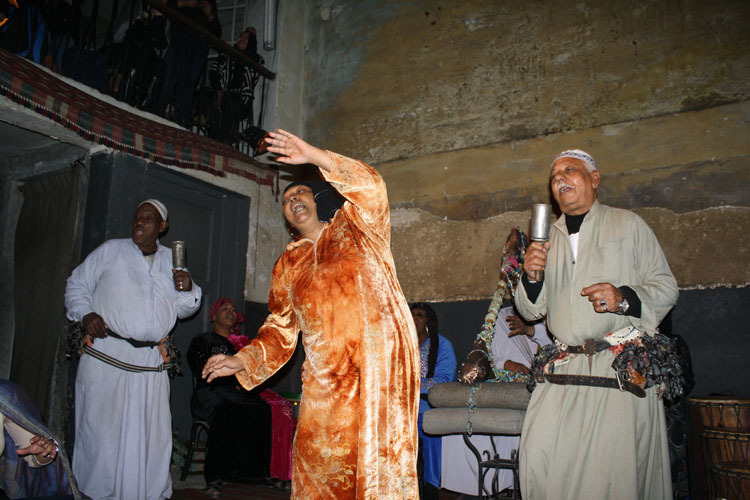 The lead singer, standing in front, is Rayyisah Madiha, often known as Umm Sameh (“mother of Sameh”). The show has varied a bit from one time I’ve seen it to another. 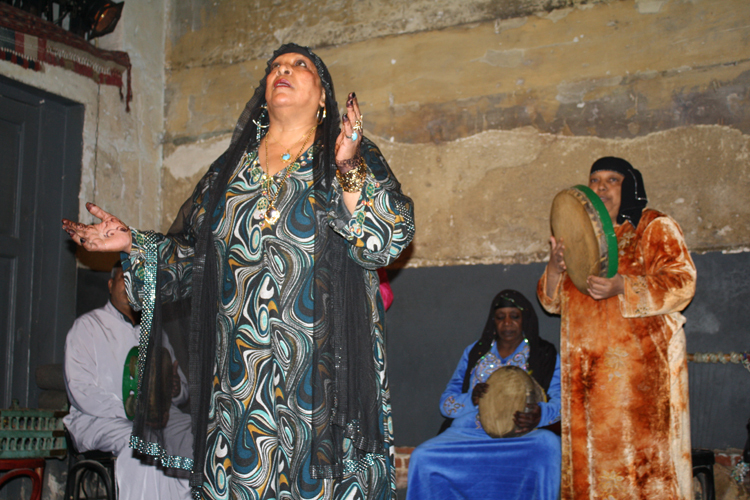 The primary segment consists of Cairo zar music, with vocals by Umm Sameh, accompanied by the other women on drums. 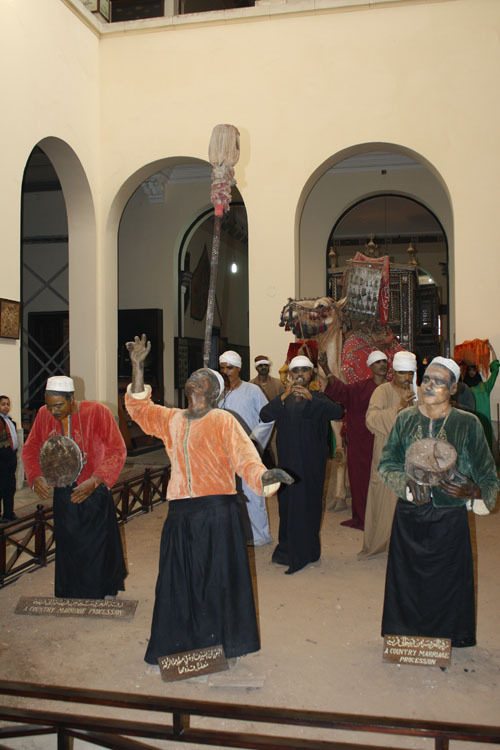 Another segment I have seen every time is described as a Nubian zar, which features different music and instruments in order to reach the different regional spirits associated with southern Egypt and Sudan. Other details of the show have varied from one year to the next. 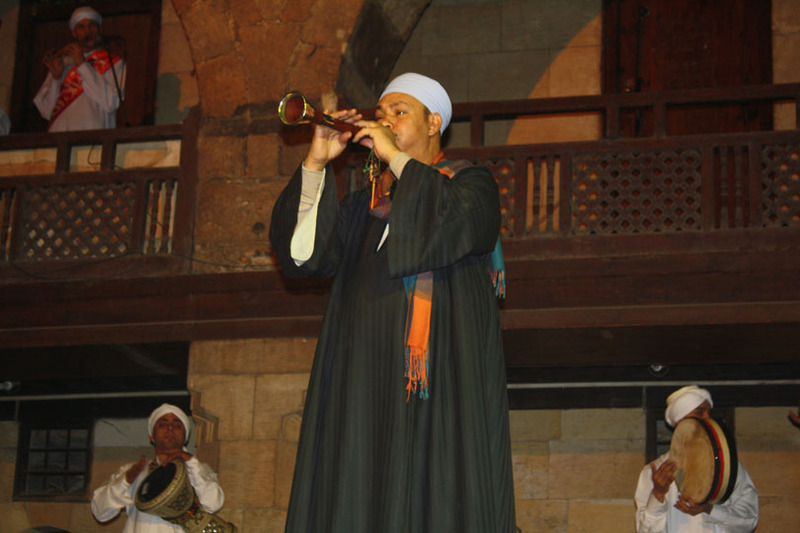 For example, when I saw the show in 2016, Sameh performed a solo of Sufi music, but other times when I’ve seen the show he did not do so. 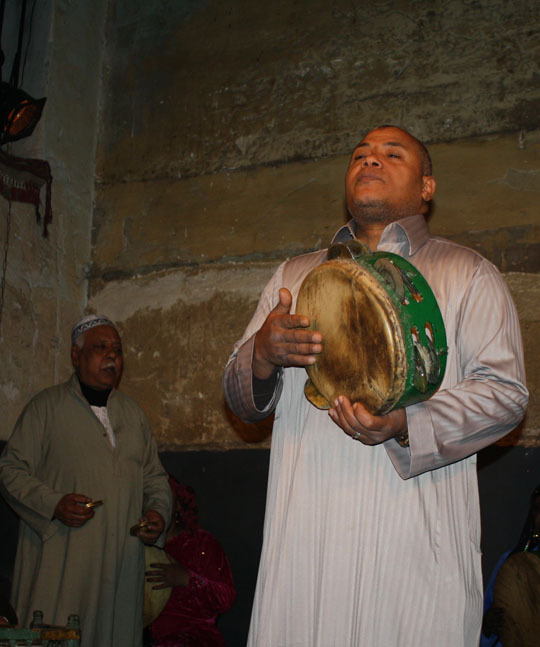 Sameh of the Mazaher Ensemble sings and plays a frame drum. February 10, 2016. 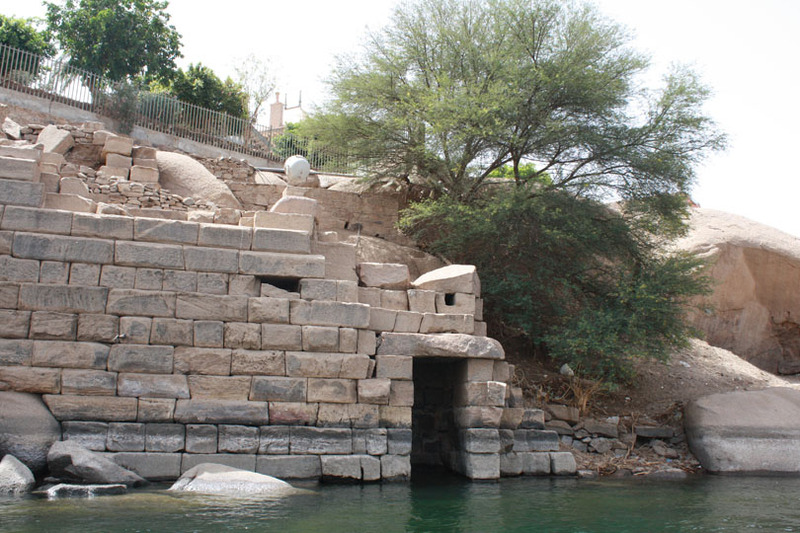 Nubia is the region spanning southern Egypt and the Sudan. The Nubian zar uses different instruments from those used for the Cairo-based zar, and the spirits it targets are different. This photo was taken February 11, 2015. The tamboura, a type of lyre, is shown in the photo above. 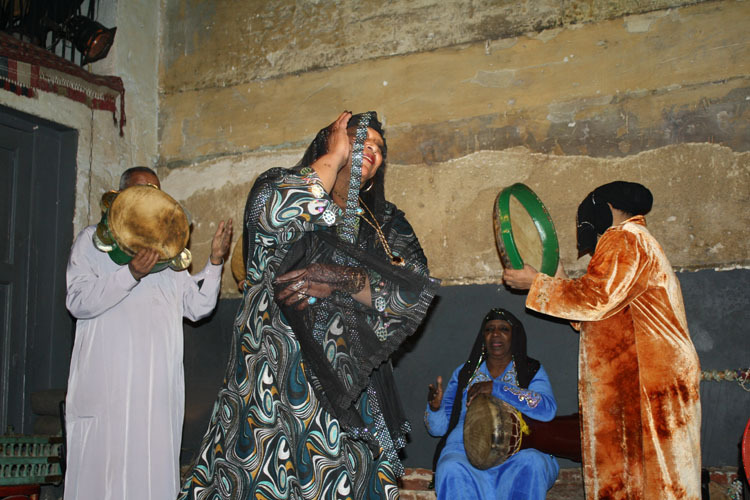 It is particularly typical of Nubian music; not only for Nubian zar rituals, but also for secular folk music. I took this photo when watching the show at Makan Theater on February 10, 2016. 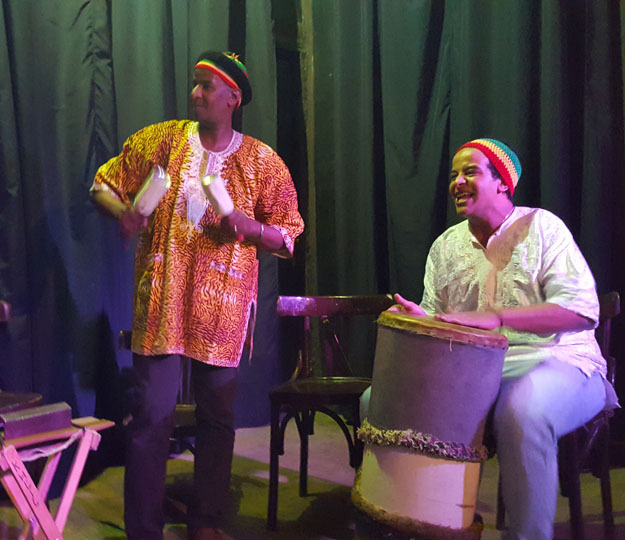 For the Nubian section of the show, one of the musicians picks up the tamboura to play it, as shown by the man seated in the back, wearing the white gallabiya. The belt that the two other men strap around their hips is known as a mangour. I took this photo of one of the musicians wearing a mangour when watching the show at Makan Theater on February 10, 2016. The mangour is a percussion instrument constructed from attaching many small goat hooves to a backing of fabric or leather. The men shake their hips in a rhythmic fashion, causing the goat hooves to strike each other, producing a rattling sound. In the photo below, the men are not only shaking their hips to make noise with the mangour, they are also using handheld rattles. When I saw the show in 2016, Madiha graciously agreed to pose for a photo with me after it was over. It can be difficult to get a photo with her, because of how many people swarm her after the show seeking photos as I did! This photo was taken February 10, 2016. 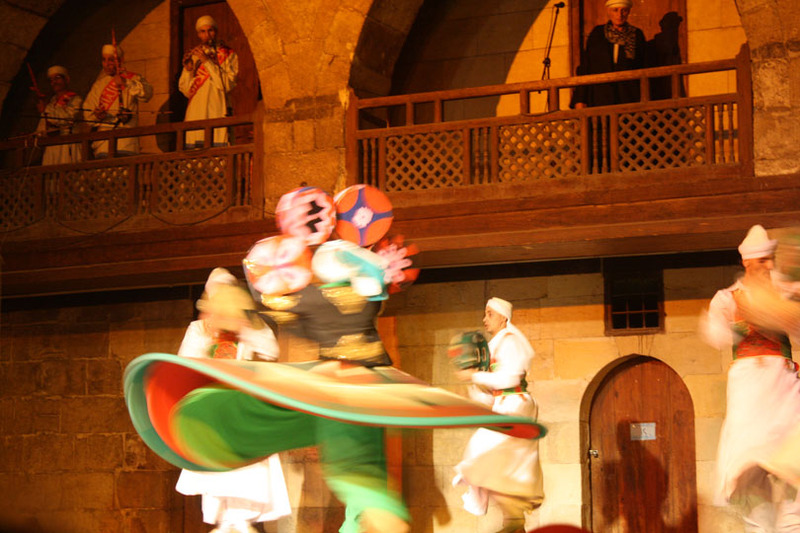 The Makan Theater, which hosts the Mazaher Ensemble’s zar music shows, is at 1 Saad Zaghloul St. El Dawaween 11461 Cairo. Their telephone number is +202 2792 0878, and email address is makan@egyptmusic.org. 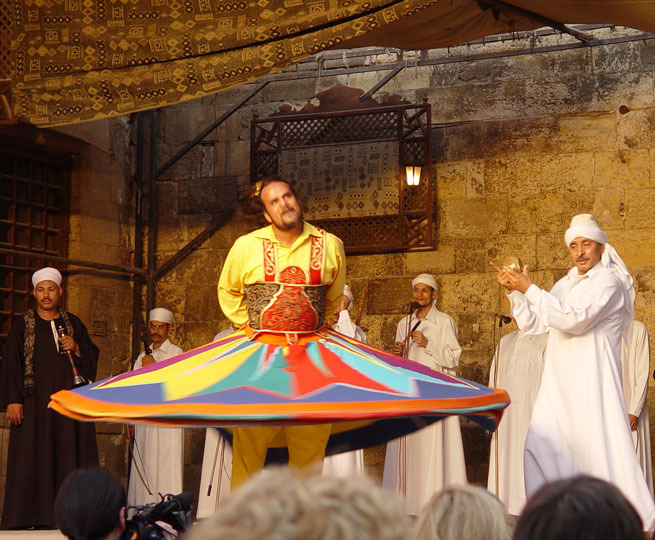 In addition to presenting the Mazaher Ensemble shows, they have also offered other shows of traditional Egyptian music, including Sufi music, Nubian, and more. Also, I recommend the book Trance Dancing with the Jinn: The Ancient Art of Contacting Spirits Through Ecstatic Dance by Yasmin Henkesh. Yasmin is a meticulous researcher whom I respect highly. 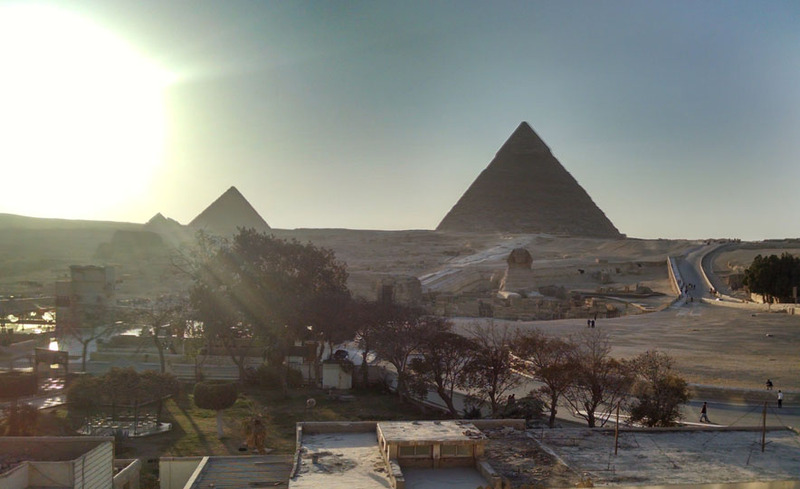 For several of my trips to Egypt, I have traveled with Sahra Kent, through her Journey Through Egypt program. The Makan Theater is one of the places I have discovered through traveling with her. I highly recommend the Journey Through Egypt program to anyone who is interested in a cultural perspective of Egypt. 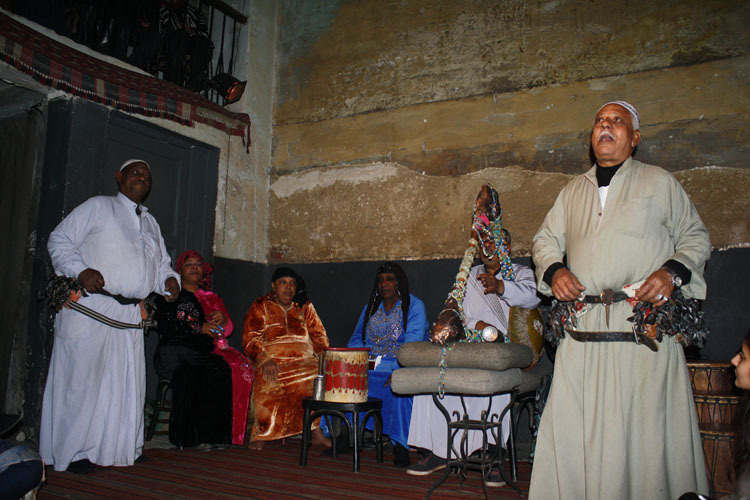 In 2016, I went with a group to El Dammah theater in Cairo to see a show featuring top Egyptian-Sudanese musicians playing Nubian music. 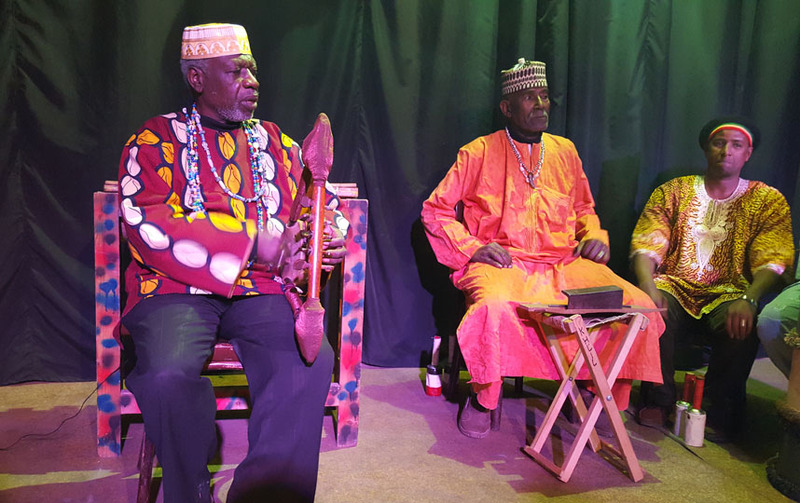 El Dammah is a small black box theater with about 100 seats that features musicians playing authentic traditional music. 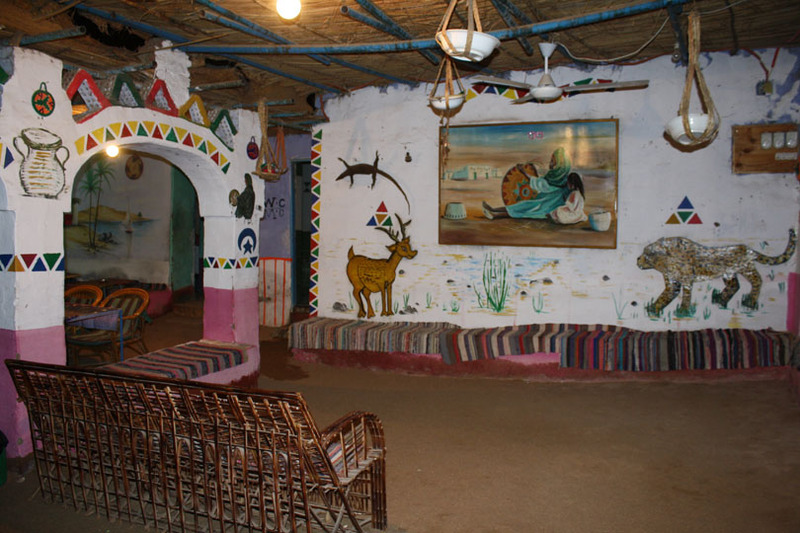 The organization that operates it is El Mastaba Center for Egyptian Folk Music. El Dammah presents a show every Thursday night. There are several different musical acts that it rotates through the lineup. 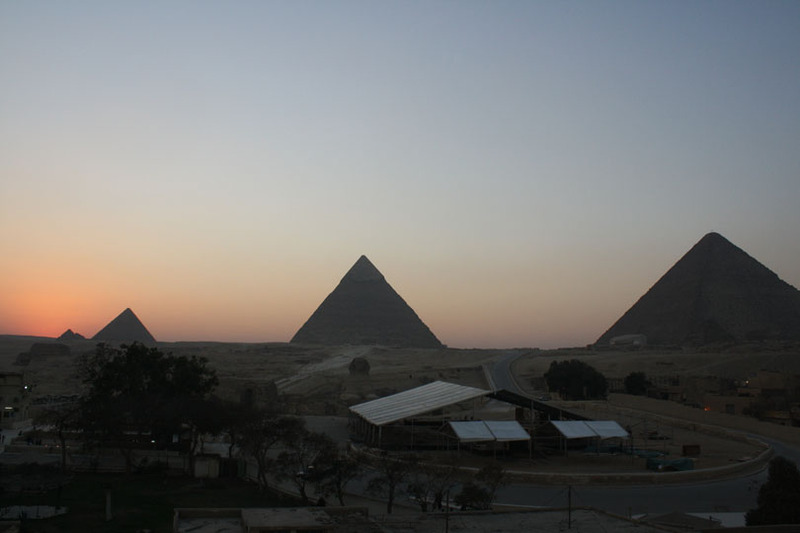 So far in my trips to Egypt, I have seen 3 different bands there. One of them was Rango. 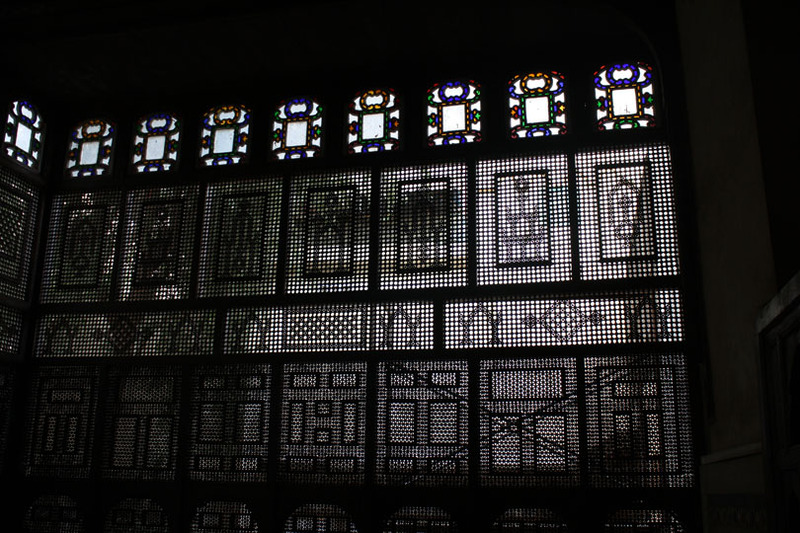 El Dammah is located at 30 A El Belaasa St, Abdeen, in downtown Cairo, Egypt. 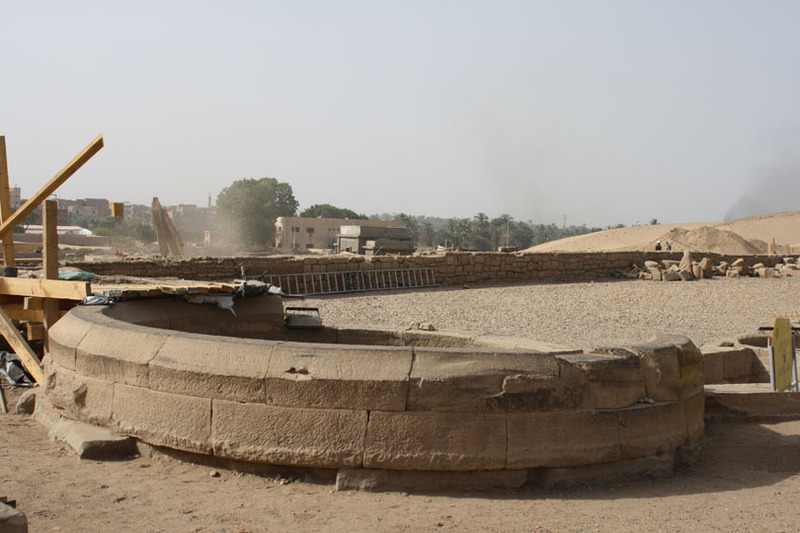 The phone number is +20 115 099 5354, and email address is info@el-mastaba.org. 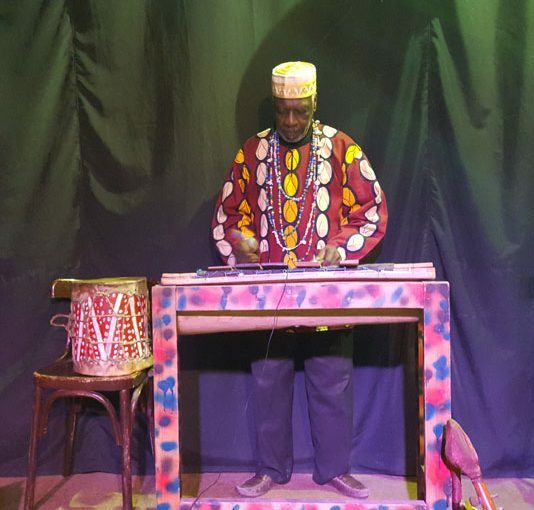 The photo at the top of this post shows Hassan Bergamon playing a musical instrument called a rango, which resembles a xylophone. 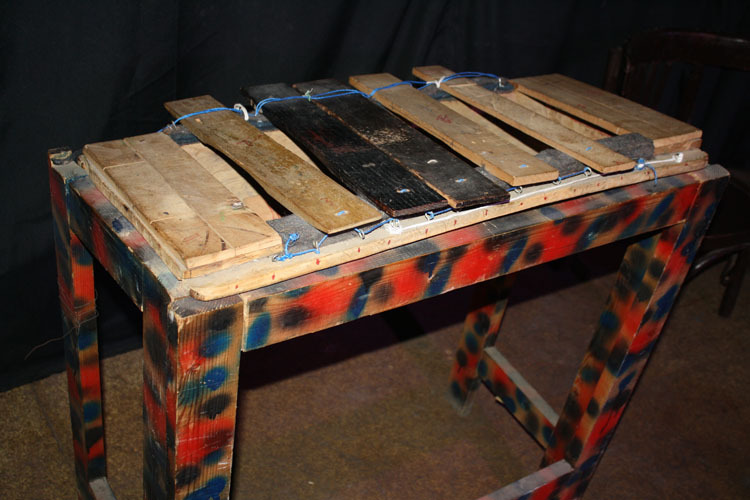 The small version that was played in this show could be called a kamba. It’s a very traditional instrument from the southern part of Sudan. It nearly died out in the 1970’s, but the art has been kept alive. According to our contact at El Dammah, today there are only 7-8 people left in Africa who still know how to play one. The musicians also played additional traditional instruments from Egypt and the Sudan. Below, one of the men is holding a rattle in each hand, which is known as the shukh-shaykh. 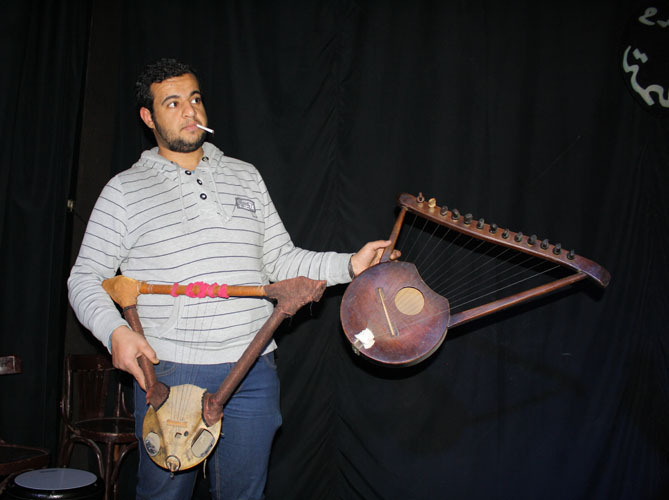 Below, we can see Hassan Bergamon playing another instrument, the simsimiyya. 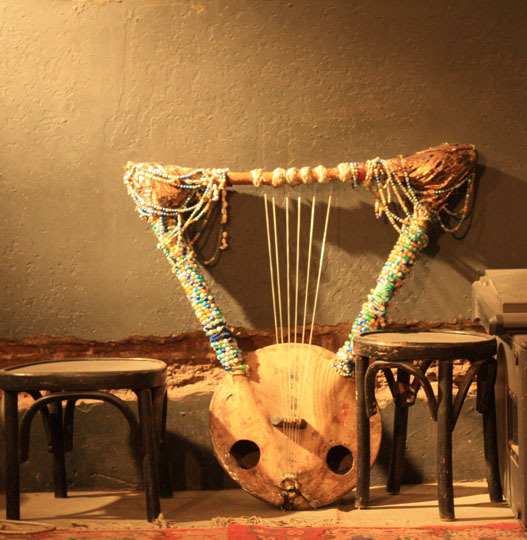 It is a type of lyre, which resembles a larger, similar instrument known as the tamboura. 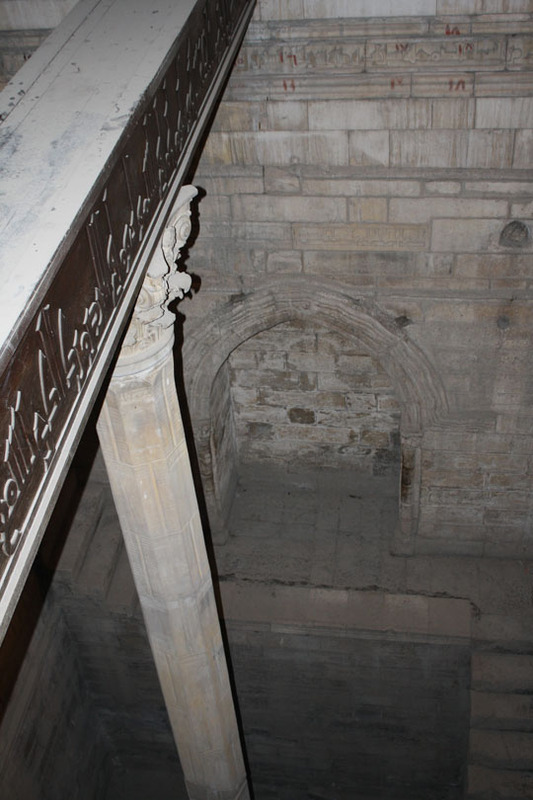 The angle of the photo above makes it difficult to see what a simsimiyya looks like. The photo below provides a clearer view. In it, a member of the El Dammah staff holds up two examples of a simsimiyya. 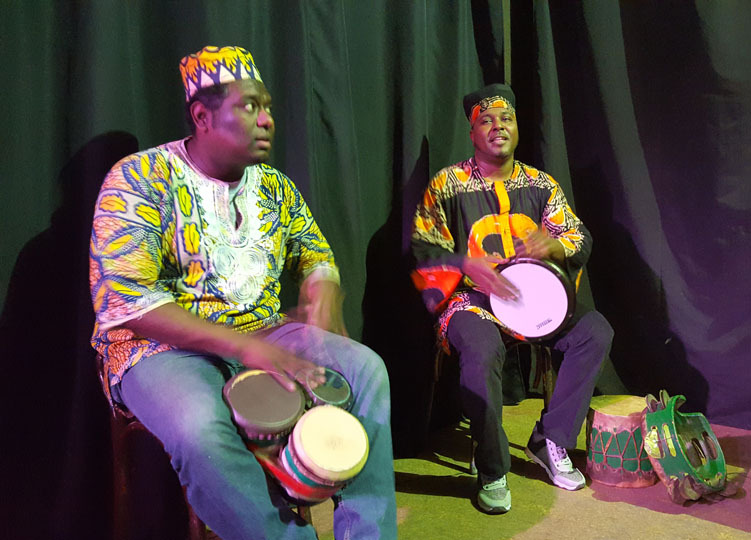 The drummers served a vital role in the show. They were excellent, and worked very well together with the others as an ensemble. It was truly a memorable performance. The show opened with a performance of songs while everyone listened, then the musicians started recruiting audience members to get up and dance with them. By the end, the event felt more like a party than it did a music performance, but that was part of what made it such an entertaining evening. The quality of the music was definitely world class! I’m already looking forward to my next visit to El Dammah, to enjoy whatever music they offer the next time I’m in Cairo! For several of my trips to Egypt, I have traveled with Sahra Kent, through her Journey Through Egypt program. El Dammah Theater is one of the places I have discovered through traveling with her. I highly recommend the Journey Through Egypt program to anyone who is interested in a cultural perspective of Egypt. 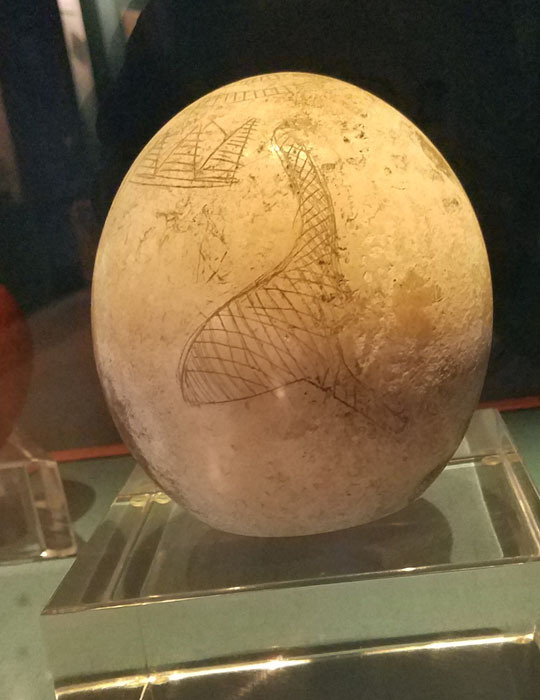 The Agriculture Museum in Cairo, Egypt is a treasure that most tourists visiting Egypt have never heard of, and never been to. It resides inside a former palace, so even the architecture is well worth taking a moment to enjoy. I think maybe the museum opened in the 1950’s, but I could be wrong about that. It’s very kitschy, in a way that I find very appealing! 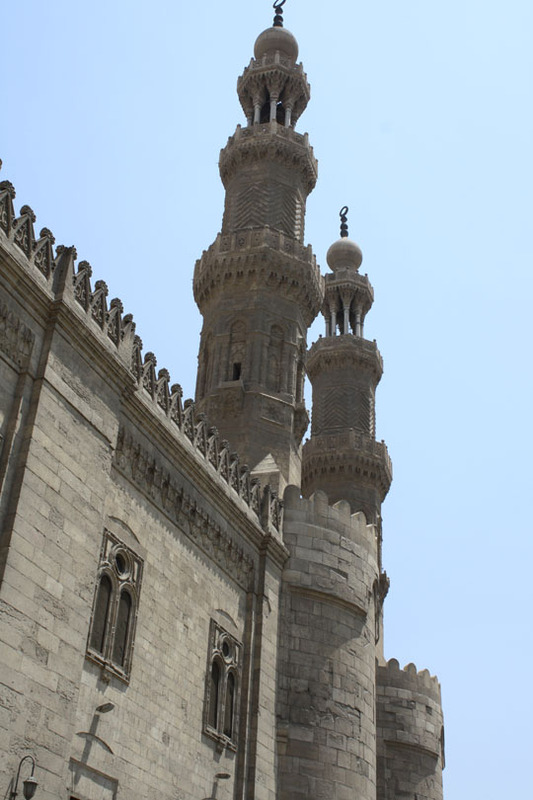 The museum is near the Giza zoo and the Cairo Opera House. On the ground floor, there is a series of tableaux showing what a rural wedding was like as of the 1950’s. It provides insight into what people wore, and what their customs were surrounding weddings. A fortuneteller casts the stones to view omens for an upcoming wedding. The above photo shows a fortuneteller casting the stones to view the omens for an upcoming wedding. In Muslim tradition, weddings do not involve a religious ceremony the way traditional Christian weddings do. Instead, there is a legal contract, which is signed by the men of the two families with witnesses. The photo below shows the men conducting this business. While the men of the bride and groom’s families complete the contract transaction, the women of the households prepare for the wedding party that will follow. 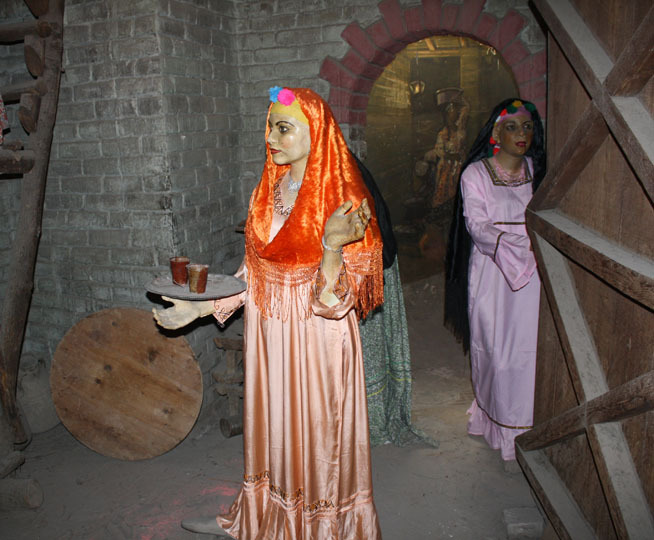 The tableau pictured below shows a woman bringing a tray of drinks from the kitchen to serve to the other women as they wait. 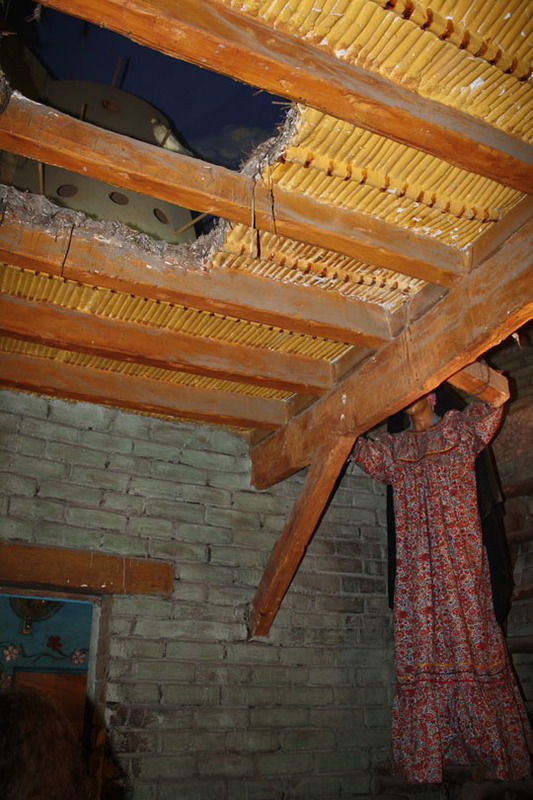 As the women wait, one of them goes to the roof to the pigeon hut, to select a pigeon to serve for the meal at the celebration. The photo below shows a belly dancer and a drummer performing for the bride and the women of her family while they wait for the men to be ready for the procession. The dancer, of course, is the one with the most vibrant makeup! 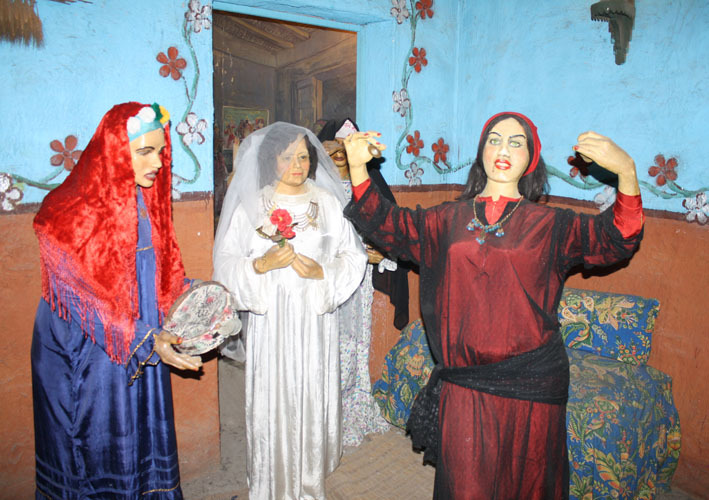 A dancer entertains the bride and her family in this tableau of a wedding at the Agricultural Museum. 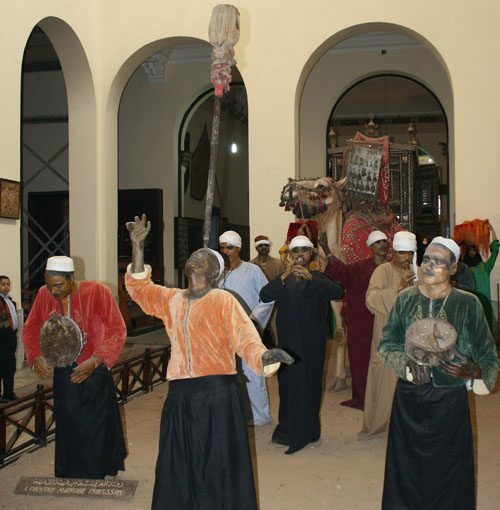 One of the wedding-related exhibits shows the zeffa (bridal procession) in which the people of a village carry a bride in a litter to the wedding party. 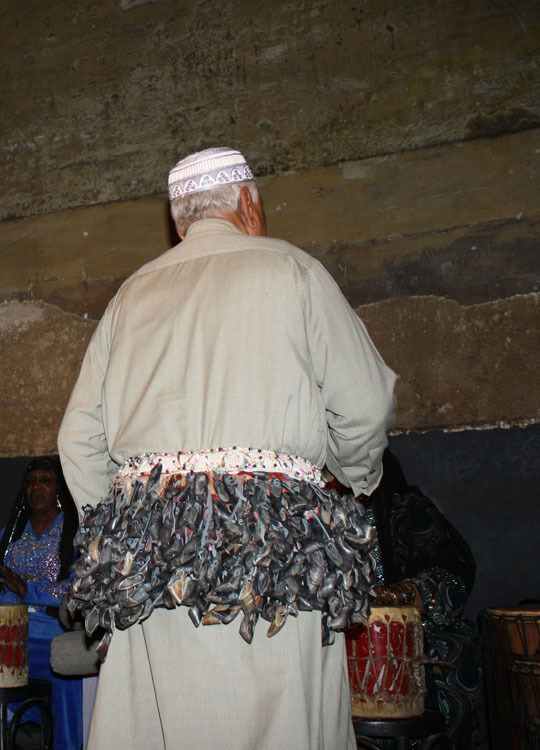 The photo below shows the men leading the zeffa, playing musical instruments and doing balancing tricks. 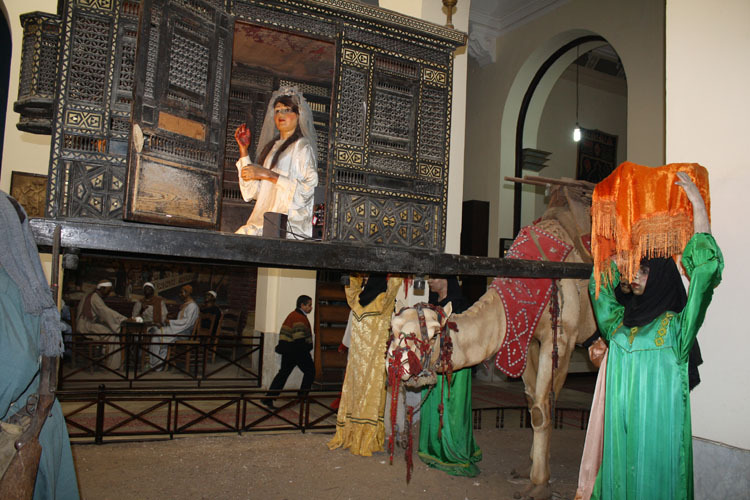 Behind them is a camel carrying a large decorated wooden box with the bride sitting inside. Performers lead a wedding procession in this tableau at the Agricultural Museum. 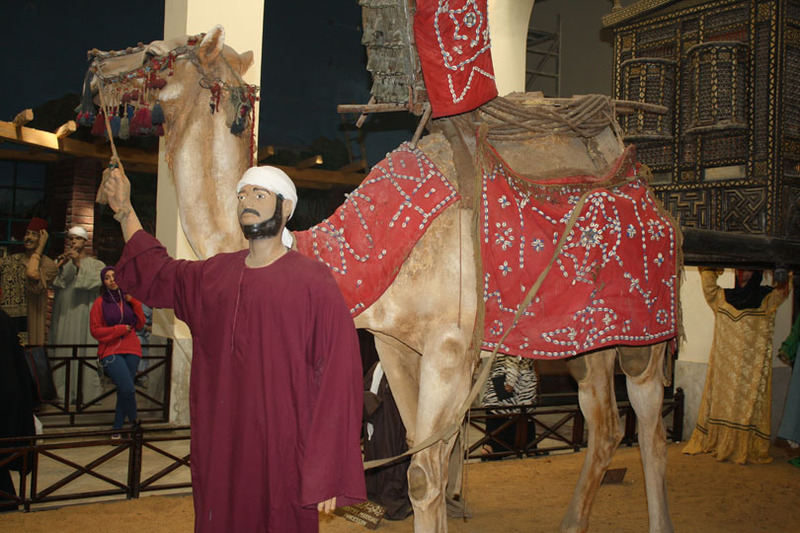 This photo shows a closeup of the camel bearing the front part of the bride’s litter. The next photo shows the bride inside her litter. This angle of the photo doesn’t show it, but inside the litter there is a little boy with her. His role would be to leave the litter and fetch anything she needs. In this tableau of a rural Egyptian wedding procession, the bride is carried inside a litter. I have visited the Agricultural Museum several times, and it’s always fun to see it again. In addition to the scenes of rural life, the main building also houses many other exhibits, including farm animals, insects, and more. 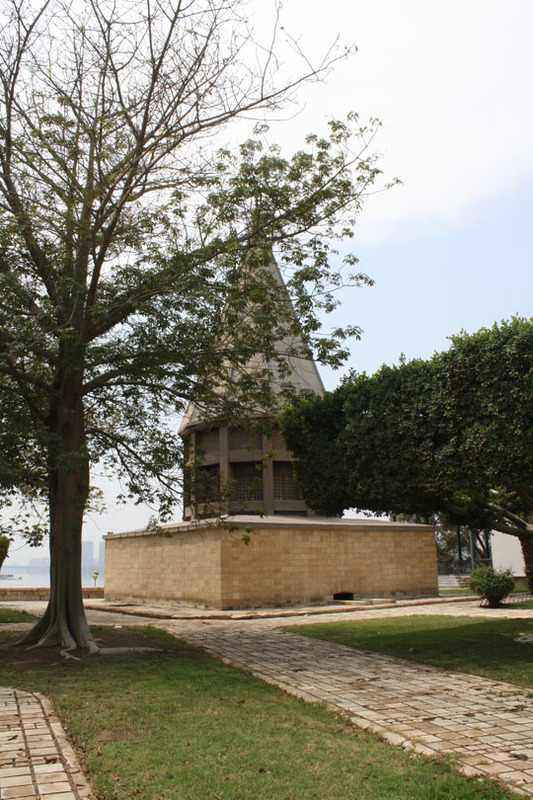 A separate building is dedicated to exhibits of Syria, referencing a period from 1958 to 1961 when Egypt and Syria banded together to create the United Arab Republic. 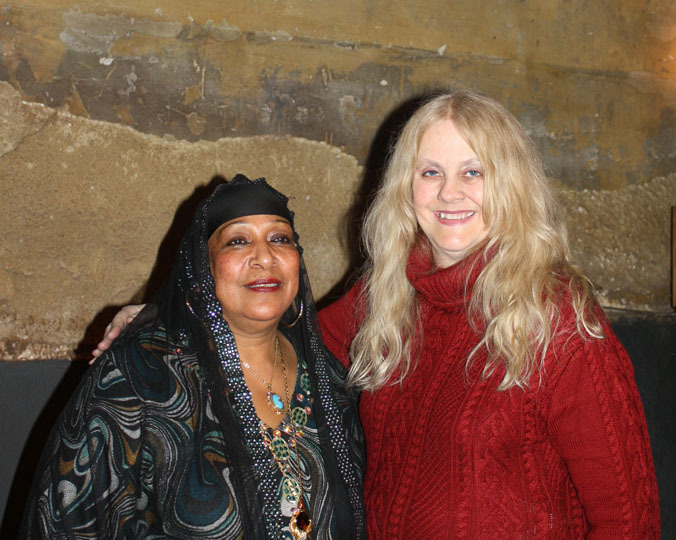 For several of my trips to Egypt, I have traveled with Sahra Kent, through her Journey Through Egypt program. This Agricultural Museum is one of the places I have discovered through traveling with her. I highly recommend the Journey Through Egypt program to anyone who is interested in a cultural perspective of Egypt.